Born 22nd August 1647, in Blois France, Papin attended a Jesuit school, and from 1661 attended the University at Angers, from which he graduated with a medical degree in 1669. In 1673, while working with Christiaan Huygens and Gottfried Leibniz in Paris, he became interested in using a vacuum to generate motive power. Papin first visited London in 1675, and worked with Robert Boyle from 1676 to 1679, publishing an account of his work in 'Continuation of New Experiments' . During this period, Papin invented the steam digester, a type of pressure cooker. He first addressed the Royal Society in 1679 on the subject of his digester, and remained mostly in London until about 1687, when he left to take up an academic post in Germany. A Huguenot, Papin was greatly affected by the increasing restrictions placed on Protestants by Louis XIV of France. While in Leipzig in 1690, having observed the mechanical power of atmospheric pressure on his 'digester', he built a model of a piston steam engine, the first of its kind. He continued to work on steam engines for the next fifteen years. 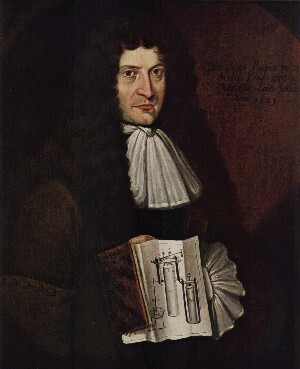 In 1705 he developed a second steam engine with the help of Gottfried Leibniz, based on an invention by Thomas Savery, but this used steam pressure rather than atmospheric pressure. Details of the engine were published in 1707. During his stay in Germany, in 1704, he also constructed a ship powered by his steam engine. The engine was mechanically linked to paddles. This would then make him the first to construct a steam boat. Papin returned to London in 1707, leaving his wife in Germany. Several of his papers were put before the Royal Society between 1707 and 1712 without acknowledging or paying him, about which he complained bitterly. Papin's ideas included a description of his 1690 atmospheric steam engine, similar to that built and put into use by Thomas Newcomen in 1712, coincidentally thought to be the year of Papin's death. Although there is no evidence of foul play, political and religious intrigue plagued the science of the day, as well as personal rivalries. As a friend of Leibniz, Papin would have been at odds with Isaac Newton, President of the Royal Society. The last evidence of Papin's whereabouts was a letter he wrote dated January 23, 1712. At the time he was destitute, and it is believed he died that year and was buried in an unmarked pauper's grave. The loss of the French War Steamer 'Papin' with half of the persons onboard. She left Cadiz bound for Senegal, on the 6th December 1845 she struck a sandbank north of Mazagan. The next day she was full of water then the funnel fell in and crushed several passengers.